Slip off your flip flops and kick up your feet! 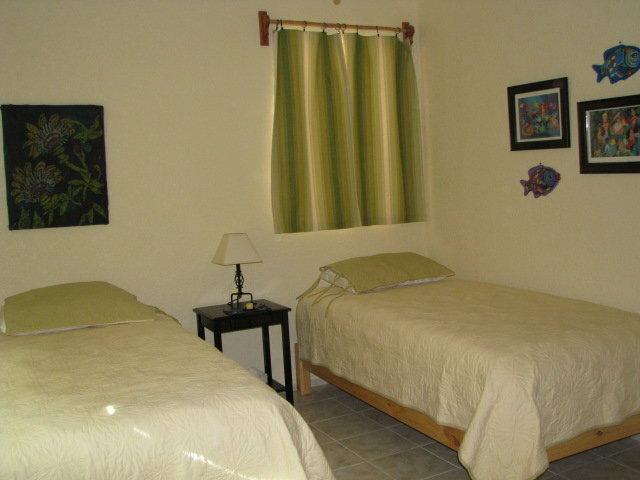 Enjoy more open space and privacy in a casita rental versus a typical hotel room or resort. 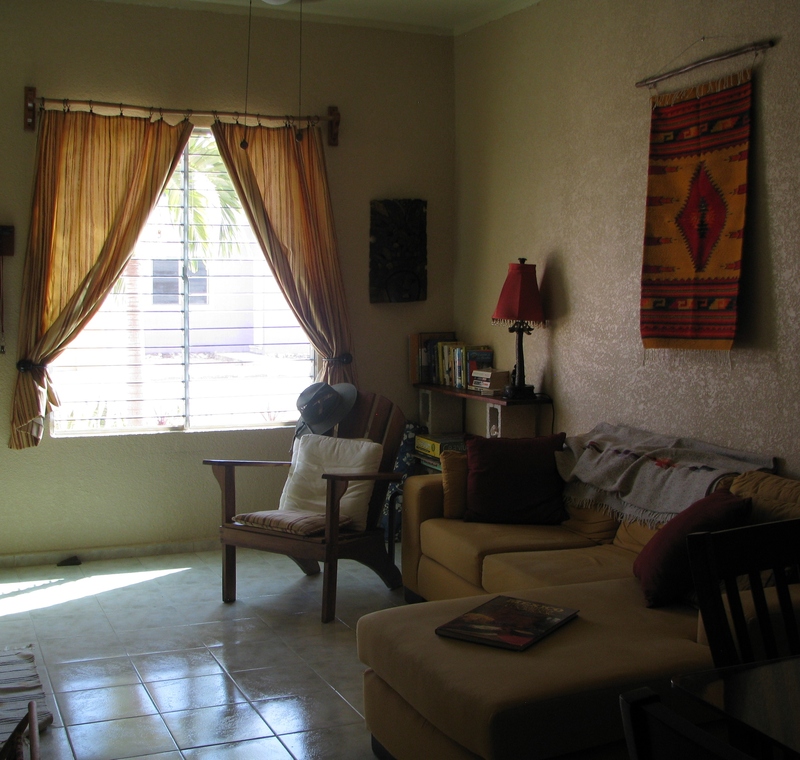 The traditional living space of Casita Paraiso has a warm, inviting energy that allows you total relaxation and will make you feel right at home. 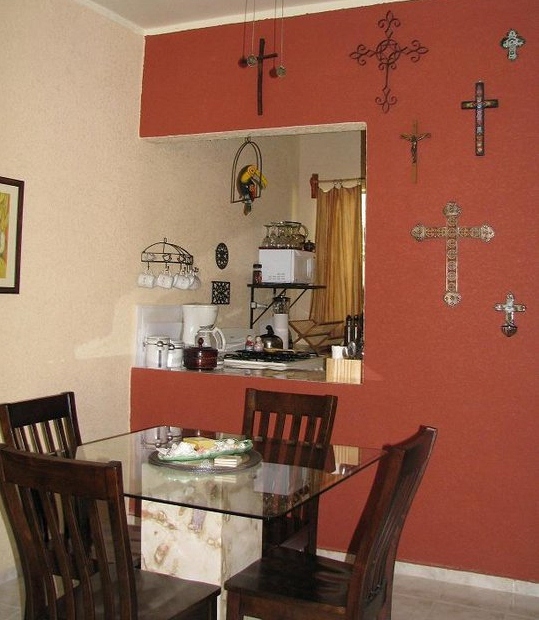 The casa is fully furnished with everything you’ll need and more. 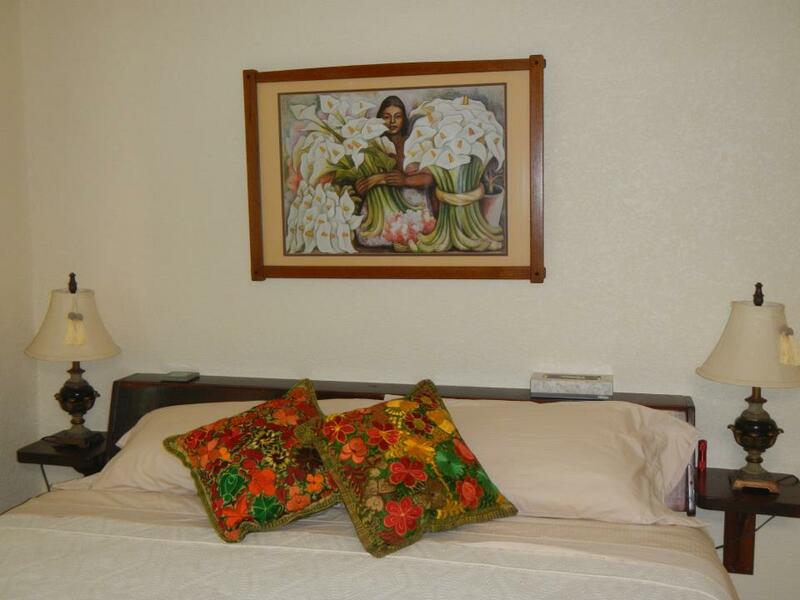 We want to share the feeling of the Mexican culture during your stay at Casita Paraiso. Our décor is inspired by the traditions and colors of the region. Comfortable living area with high ceilings, tile floors with cool touch to the feet, cozy sectional sofa, glass top dining table and nice wooden chairs. We have a flat panel TV, DVD player and an old school SEGA Genesis game console as well as board games and a library of books for your relaxation. We do not have cable television since there’s not much need for TV when you’re in paradise! If you have a laptop that you travel with, you’ll be happy to know that we provide complimentary WiFi so you can always connect to your Netflix account. We also have a nice selection of DVD’s. There’s also Wifi at most restaurants. Enjoy your music playlists with our Bose Bluetooth speaker. We also have guide books and maps for your use while exploring the area. For your complete comfort there are ceiling fans and A/C throughout, each room individually controlled for the best comfort levels. During the winter months and breezy days, open the jalousie windows and enjoy the Caribbean breeze! Enjoy dreamy, restful sleep in the master bedroom on a quality, comfortable king-sized mattress with luxurious linens. Built-in closet organizer with lots of space. Handcrafted in beautiful wood, the headboard is slightly reclined with lots of pillows for perfect lounging and reading in bed. Also handcrafted from local hardwood is a wall vanity and beautiful large tin-punched mirror framed in Talavera tile. This allows guests more space for getting ready to go out for the day or evening. Guest bedroom has two twins or easily push together and create a king-sized bed. Additional king bedding provided upon request. High thread count linens and quality mattresses after your daily activities in paradise create the perfect recipe for a heavenly night’s sleep. Ample closet space and built in wall vanity. Room darkening drapes gently float as the sea breeze blows through all of the jalousie windows. We also have available for your use; an ironing board, a Weight Watchers bath scale and a blow dryer. Wake up at your leisure to your own fresh pot of coffee. Dine in and free yourself from too many choices, expensive room service or vending machines. Enjoy relaxing meals at our glass top dining table with limestone base made by Mayan stone cutters in Dzitya near Merida or dine al fresco on the patio. Well equipped kitchen with cookware, assorted local glassware and dishes, small appliances – coffee maker, grinder, electric juicer, electric griddle, crockpot, blender. Purified water provided for cooking and drinking. Every kitchen tool you need to whip up your favorite Mexican dishes and beverages. Visit the local produce stands, bakeries, tortilleria for fresh tortillas, meat markets (carneceria) and local fisherman (pescador) for all of the freshest foods of the region. You can even arrange a cooking class from one our local Mayan neighbors in the pueblo who will teach you how to shop and cook in Mexico. 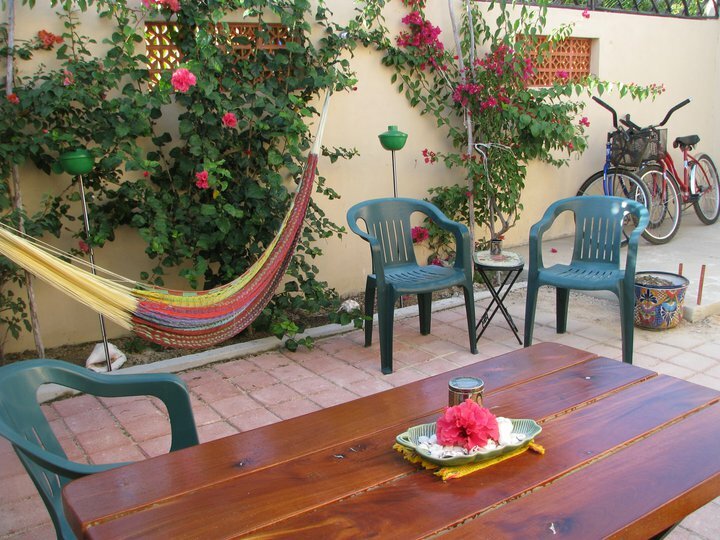 Private & secure patio area where you can lay in a hammock, hang dry clothes and towels, and even an outdoor shower area. 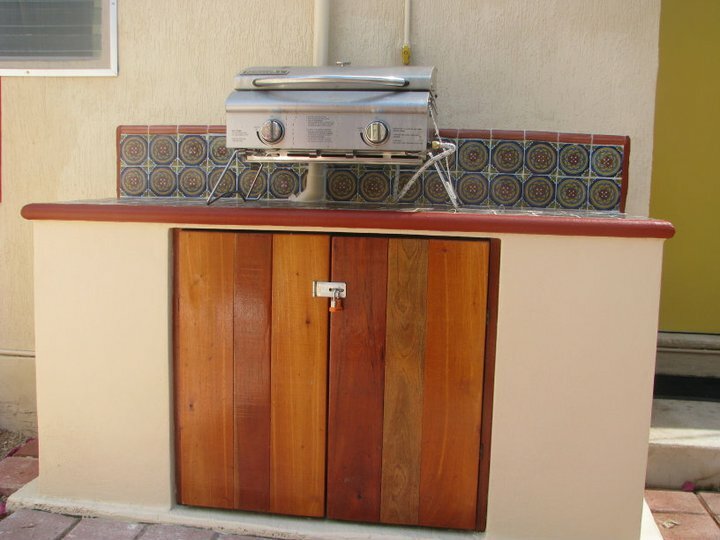 Enjoy dining al fresco and the outdoor kitchen counter where you can prepare or serve your food on beautiful handcrafted Mexican tile countertop. There’s a stainless steel gas grill, tiki torches you can fill with citronella for those muggy buggy summer evenings, a lovely handcrafted picnic table (built by Mark from local Mayan wood and wood from our NW forest) and plenty of chairs for lounging. Have your coffee and breakfast in the morning in the shade. Relax while watching the tiny lizards, geckos and hummingbirds visit and listening to the sounds of the jungle birds all around. Pure pleasure! 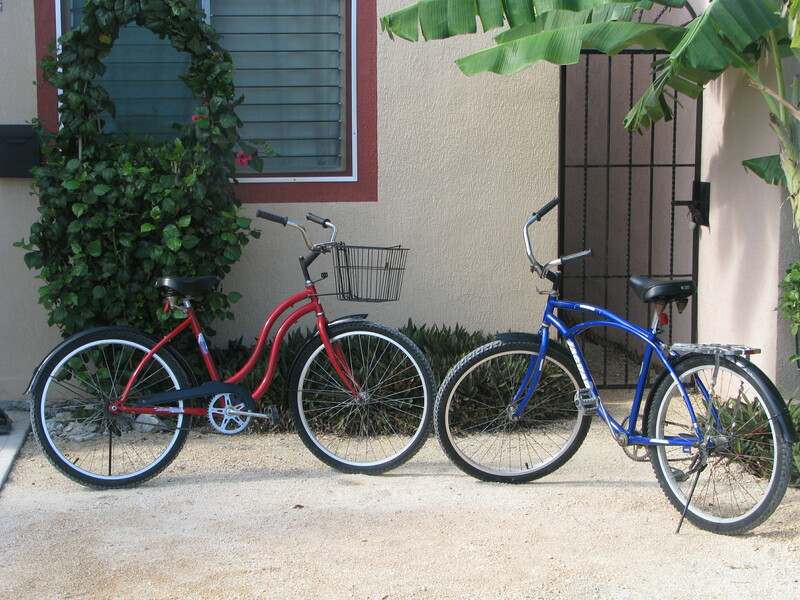 His and hers Jaguars for taking a spin around the neighborhood, a ride to the beach or over to the village for a few essentials. Throw the backpack chairs over your shoulders – they even come with a built in cooler! We have a matching Tommy Bahama umbrella, a sunshade, an softside insulated cooler and insulated shopping bag, 2 adult boogie boards and swim noodles. For kids, there’s a great sand bucket and sandcastle making toys and 2 small kick boards. Beach towels are also provided so that you don’t have to pack them!